Flower garlands can be made in many different ways. Starting with a heavy twine, such as Oasis Bind Wire, you can wire flowers and greens directly, moving down as you add more bunches. This method works well for all greenery, which is durable and tends to last longer than flowers. Flower garlands, however, need a water source, particularly if you are using flowers that wilt quickly such as hydrangeas, Gerberas, viburnum, and lisianthus. An Oasis flower garland is cylinder shaped Max-Life foam, that once soaked in water treated with Crystal Clear flower food, can keep your fresh flowers at their best. Flower dense garlands can be very expensive when purchased through flower shops, sometimes running hundreds of dollars for just a few feet. If you are willing to put in your own labor, you will have better control of the price. You can also add in inexpensive greenery, stretching your flower budget even more. Be care to shop wisely if buying online. Some wholesale websites advertise "free shipping", but may require large minimum purchases and/or split grower bunches in half. You should always read the fine print and break it down as cost per stem to see what you are actually paying. I sell full grower bunches of both fresh flowers and greenery, so you get the same amount as you would if you were a flower shop making the same purchase. I list the shipping separately so you can see exactly what the flower cost and what you are paying in freight. Shipping is always figured somewhere, as nothing on the internet is truly "free". My hope is that the bride will save money and be able to buy the professional products like flower sealants, flower food and re-hydration products. These are the basic items that every florist uses to get the longest life out of their flowers and you should be using them as well. I lead you step by step through processing your fresh flowers from the moment they are delivered. If you don't find something you need (even flower varieties) give us a call. All products are shipped from one of the largest floral distributors in the United States. If it's in season, we can probably get it for you or a comparable substitute. I don't give you just two or three pictures and a "quickie" demonstration. I take you through the design process step by step, teaching what different products are used and why you are using them. Your wedding flowers are a big investment. If you really want to save on your flower budget by providing the labor, I want to do everything I can to ensure that you get the most out of your lovely flowers! Please check out all my flower tutorials. 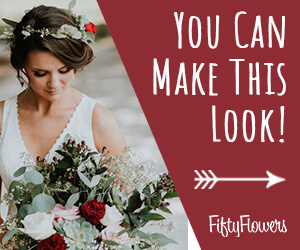 They are packed with ideas for creating beautiful bridal bouquets, corsages, boutonnieres, church decorations and reception centerpieces.